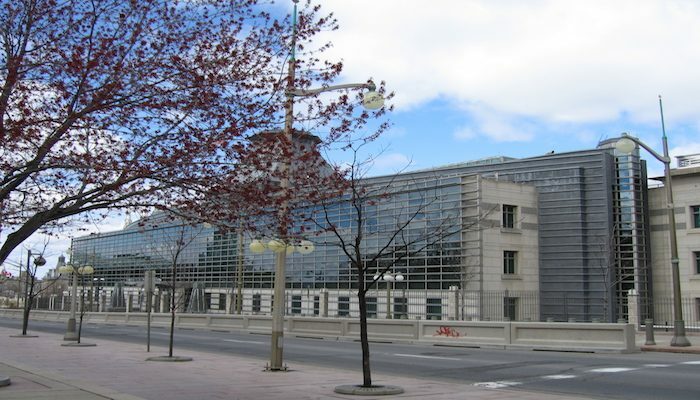 Ottawa is home, naturally, to many major embassies. Most of them are interesting buildings, clustered within a couple of square miles, in some of Ottawa’s nicer residential areas. We have put together a route that takes you by many of the major embassies. Start on Parliament Hill, and head out Sussex Drive toward the U.S. Embassy. At the McDonald Bridge, turn right and then onto Dalhousie St., which goes by several embassies and is also in the historic Byward Market area, home to lovely older buildings and many shops & restaurants. Head left on Rideau St. (Rt. 34), and then right on Charlotte St. (Rt. 48), site of several embassies. This will take you to Strathcona Park, location of the German embassy. Do a quick 1/2 mile loop through the park and then head west on Laurier Ave., with embassies on one side and the University of Ottawa on the other. Conclude with a jaunt by the National Defense building. A nice 2.5 mile add-on, with even more embassies, is heading further along Sussex Dr. at the beginning of the run, to Rideau Hall (or even further to Rockliffe Park), which is the Gov. General’s residence (and current temporary home of Canada’s Prime Minister, Justin Trudeau, while his home at 24 Sussex is being renovated). It’s possible to run in some of the grounds of Rideau Hall. Then complete the loop along Princess Ave. and Dufferin Rd. to Stanley Ave., crossing the river on Union St. to rejoin the run. Start: Parliament Hill - Centennial Flame.